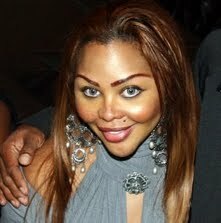 When I was younger I was obsessed with Lil Kim. It wasn't so much about her lyrics, but just the fact that she was cute, petite and full of energy! I loved her and wanted her to be my big sister. Maybe it was the fact we were both vivacious cancers, but I was team Kim all the way in the 90s. Nevertheless, I was very disappointed to see her transformation over the years. There were times I thought that she had f*cked up her face beyond recognition... but when I came across recent photos of Kim at her salon opening I rejoiced!!! Somehow she worked a bit of magic and got her cute look and cute face back. I'm thrilled... and can I just add that her body looks great!